If you use a hose in your garden or yard, then you certainly need a garden hose reel to help you store and preserve your hose in an organized and efficient manner rather than leaving it scattered improperly on the ground. It will help protect it from potential damages and as well keep your garden looking neat and clean. A garden hose reel is a metal or plastic storage equipment that is used to conveniently roll up a garden hose around a hollow core in order to properly store it and as well make it easily accessible. It can come with a housing or covering depending on the type where you draw the hose back in. It’s designed to be used either on the ground or attached to the wall. A garden hose reel operates in two ways, manual rewind or automatic rewind. Manual or direct crank reels have a handle that’s attached to the drum. As you turn the handle, the hose is either rolled up back it or drawn out. An automatic hose reel on the other hand retracts the hose for you with just a flip of a lever or press of a button. What is a retractable garden hose reel? A retractable or automatic garden hose reel is a garden hose reel that’s designed to retract the hose itself. It comes in a plastic housing featuring a spring-loaded mechanism which it uses to draw the garden hose back in. Automatic or retractable garden hose reels employ an internal spring-loaded mechanism to automatically pull the hose back onto the reel and roll it up neatly inside the unit. When you pull out the hose, it puts tension onto the spring. This tension on the spring enables the hose to automatically retract back onto the drum reel. It can either accommodate the entire hose reel or distribute it side to side inside the housing such that it doesn’t clump together. The retraction of the hose occurs once a lock mechanism is disengaged. It can come with an automatic guide which prevents the garden hose from overlapping while retracting. It’s quick and easy to use, and really great for large gardens. There are numerous types of garden hose reels in the market ranging from standalone to cart to wall mounted hose reels. Each type consists of many different models and knowing which one is the best can sometimes be difficult. This comprehensive review will help guide you in a clear and objective way. We’ve picked the top 14 garden hose reels currently available in the market and prepared an in-depth review of each model below. Our review covers the three main types of garden hose reels and in each category we’ve listed the best models you can consider based on your needs. We’ve put together a buyer’s guide too and included some other useful information to help you make the right decision. So, read on and find out which unit will suit you best. A wall mounted garden hose reel just like its name suggests is a hose reel that can be mounted on the wall using brackets. It can be mounted either perpendicularly or parallel to the wall. The biggest advantage of this type of hose reel is that the hose is held in a more secure and sturdy manner when in use and not in use. It’s up in one fixed place and definitely out of the way. It’s quite convenient too as it doesn’t take much space and you can mount it right next to the faucet. It makes pouring simple and convenient since it can be pivoted by 180° allowing you to access every area of the garden without any difficulty. Moreover, the fact that it’s always in the same place means that it’s always at your disposal. It’s an ideal solution for smaller gardens and if you don’t need to move a reel to different locations. In the first position is the Eley/Rapid Reel model 1401. This is by far the best rated wall mounted garden hose reel in the market and our top choice for best wall mount hose reels. It’s a high-quality hose reel with a very solid built quality and performance that really stand out when compared to other similar type of hose reels. The major highlight of this Eley unit is its superb, solid construction. It’s absolutely built to last using materials of great quality. It’s constructed with a heavy-duty aluminium-alloy with solid stainless steel mounting hardware. It will completely withstand any kind of abuse and environmental condition. In particular, the aluminum-alloy construction is rust proof. This is a very useful feature as it will allow water on a daily basis without having to worry about the reel developing any rust. The brass fitting and rust-free swivel are also solid and make this model even more durable. The whole unit is quite compact, measuring 19 inches wide and extending to about 19 inches from the wall. It certainly won’t take much space on your wall. Pulling the garden hose off is a breeze. It spins with ease without getting stuck. The unit has smooth spinning axle bushings which allows the garden hose to spool up easily and nicely with very little guidance from your free hand. There is a stainless steel spring that goes inside the end of the feed hose to keep it from kinking where it loops to attach to the swivel. You can retard the speed of the hose while withdrawing it as it features a racheting setting. This is a wonderful feature to have especially when you don’t want the garden hose scurrying onto the ground. The 1401 also features a cam lever brake which locks and unlocks a clutch to prevent the reel from spinning when you’ve drawn the hose to your desired length. The clutch works efficiently and holds it firmly. The crank handle is quite comfortable and offers a firm grip. Moreover, whether you are right-handed or left-handed, you will have an easier time using this unit. It allows for both right and left-handed rewind, so you get to use the direction for rewinding that suits you best. There’s as well a hold down strap which holds the hose in place on the drum to ensure that no tension is extended the hose loop, even when it’s all spooled out. Another thing to appreciate about this Rapid Reel 1401 model is its massive capacity. It has a huge storage capacity capable of occupying up to 150 feet long 5/8 inch hose. It can fit a 100 feet ¾ inch hose, so you can use the brand and style of your choice. You will find very few hose reels that can allow you store different sized hoses. The construction of the whole unit is such that no single drop of water can leak from any part of the reel or the fittings. It has a solid swivel made of brass and aluminum, and 6 ½ feet polyurethane in let hose. All these are super-strong components that make this unit totally leak-proof. This is one of the most versatile garden hose reel on the market. You can mount it to almost any wall surface, stucco or concrete, and a brick face or mortar joints. It gives you multiple options for both accessibility and mounting. It has a unique mounting style that allows you to mount it in a perpendicular or parallel way depending on the size of your wall and its texture. This set up style options provide great convenience since you get to choose the configuration that works best for you. With its smooth rectractability, this Eley wall mount garden hose reel is an ideal choice for those who have spaces that are challenging or prove difficult to access with the other types of garden hose reels. It comes with both the mounting hardware as well as clear, well laid out instructions with helpful diagrams. If you are looking for a highly durable and effective wall mount hose reel, then the Eley 1401 model might be the best pick for you. If you are thinking of getting an advanced garden hose reel that can retract automatically, then the RL Flo-Master 65HR8 is an option you certainly want to consider. This is the best retractable wall mount hose reel in our list, one that will make rolling up your hose much easier than before. The RL Flo-Master 65HR8 comes in a sleek modern design that would look nice on any wall it’s mounted on. It’s quite compact and won’t take much space on your wall. The unit has a solid body made of good quality materials with the outer housing consisting of a sturdy plastic material that’s durable. It will endure the outdoor conditions and the wear and tear brought about by the changing weather conditions. With proper care, this is a hose reel that can certainly give you a few years of service. Moreover, despite being a wall mounted hose reel, the RL Flo-Master 65HR8 is designed to be portable. It features a carry handle and you can easily remove it from the all and store it inside after usage especially in the winter months. With this unit, you will be able to efficiently carry out your watering chores without any hassle at all. Unlike using a hand crank, it employs an automatic retracting mechanism that makes rolling up the hose a lot easier. It will save you both time and effort. The unit utilizes a heavy-duty retractable spring that automatically pulls the hose back into the reel without any bending or cranking. The operation is extremely seamless and all you need to do is to pull the hose on the side once you are done and the lock will release allowing the spring to automatically pull back the hose into the unit. An automatic guide is also incorporated into retracting mechanism which is a very handy addition especially when dealing with retractable hose reels. The guide stops the hose from overlapping or getting tangled on the reel while retracting hence saving you from the hassle of having to wind the hose up by hand. You will not have any difficulties accessing every area of your garden with this RL Flo-Master 65HR8 model. The wall mount bracket is designed to facilitate some mobility. It allows the reel to rotate 180⁰ which means you can swivel it or point the hose to where you exactly want to water for easier operation. The design of the whole unit is basically made to provide great convenience during usage. Plus it has an extra finishing that prevents the hose from rubbing as well as leaking which is really commendable. The best part about the RL Flo-Master 65HR8 is that it comes fully assembled. The only part you will have to deal with mounting it on your wall which can take only up to 20 minutes to complete. The mounting hardware is included in the package to simplify the whole process. It comes pre-installed with a 5/8 inches hose featuring a threaded brass end. The hose is 65 feet long, so it’s not that large, but should be for every day watering in small garden. You will also get an eight-pattern nozzle that can do different sprays which is a nice touch. Given that it’s portable, you can easily remove it for storage if you would prefer not to have it out in the winter. The only setback is that it might stop retracting after a while. However, this is a common problem with most retractable hose reels and it’s something can easily be avoided with proper care. Generally, this is a superb retractable model that operates efficiently without requiring much effort from your end. It’s compact and the retraction mechanism works seamlessly. If you have a small garden and don’t want to deal with a hand crank, this might be the right choice for you. Our third top hose reel is from Liberty Garden products, the Liberty Garden 708 wall mount model. This is perfect option for those looking for a really stylish yet effective hose reel that will last for many years to come. It’s a high quality, functional reel with an attractive bronze finish that gives it an elegant look that will not doubt go well with any wall décor or color. It’s just not the looks that propel this unit to the third spot on our list. It’s pretty tough, constructed to provide a lifetime of service. The whole frame is made with a heavy-duty, 13-gaude steel including the roller handle. The steel construction has been further reinforced with a durable powder coat finish to give it complete protection against all weather conditions. It’s an extremely tough unit that can handle maximum abuse and still continue working without any problems for a very long time. The fixtures are also made from solid brass, so you can expect a very long life from it. The unit is quite compact too, measuring 21 inches wide, 15 inches long and 15.7 inches in height. It won’t take up much space. There’s a little storage tray on top and this is another convenient addition in the design. It’s perfect for holding your watering and garden tools. Although it’s a manual hose reel, this Liberty Garden 708 is simple to use. The reeling mechanism works perfectly. It’s very smooth and effortless to roll up and unroll. It has a non-slip rubber handle made of a heavy duty metal. The crank turns easily and the handle is long enough to facilitate a decent turn with every crank. The handle is designed such that you can mount it on the right or left side according to your preference. If you have a long garden hose, then you will love this unit too. It can accommodate up to 125 feet if 5/8” hose, which makes it suitable for medium to fairly large gardens. Like I mentioned earlier, the connection is solid brass. It firmly affixes to the hose that comes from your main water source. The fittings are of high quality and you can expect no leaks from this model. The solid brass swivel is capable of rotating 90˚ which is not a large coverage but will help prevent the hose from getting damaged when you pull it out at the wrong angle. Like the RL Flo-Master 65HR8 above, the Liberty Garden 708 comes fully assembled and it’s fairly simple to mount on the wall. It can be a little bit tricky though to mount it on a solid brick or concrete wall because it does not come with any mounting hardware. You may also have to install it inside the garage or a covered area where there’s a shed since it doesn’t have a cover and as such, the hose will be exposed to weather conditions and UV rays. Another slight downside is that it does not have a lock or set crew which is quite handy when you want to keep the hose from moving once it’s fully reeled in. Overall, this a high-quality and effective wall mount hose reel that’s not only extremely durable, but also quite attractive. It’s definitely worth every penny and an option we would highly recommend. Following the Liberty Garden 708 decorative is another classy looking Liberty model, the Liberty Garden Products 710 navigator. However, what sets it apart from the rest is its exceptional rotation capability. It’s simply the best swivel wall mount garden hose reel that we’ve reviewed so far and it offers amazing performance with minimal hassles. Made from 18 gauge steel with durable powder coat finish, this hose reel boasts of a super tough construction that will endure the cruellest weather conditions. All the fittings are brass galvanized too plus the powder coat finish makes it rust-proof, so it’s highly durable and will certainly give you longer lasting years of use. Like the Liberty Garden 708, it also has an integrated storage shelf which is a convenient addition as it provides ample space where you can store frequently used accessories and tools for quick access. The 710 navigator isn’t very wide either. It’s only 16 inches wide, 13.5 inches long and 20.5 inches tall. Wherever you mount it, it will leave plenty of room to move around it with much ease. Just like its prior sibling, this unit allows one to wind and unwind the hoes easily and efficiently. The reel turns smoothly and quickly, even when rolling up a 5/8-inch garden hose fill of eater. The crank handle is large enough for easy grasping and has a non-slip rubber padding that’s offer a firm, comfortable grip. It stays put in the hand and turns easily as you crank the arm without spinning. The crank arm is also of a good size. You won’t have to turn it so many times like in other models just to roll up the hose. Even much better, you can use the handle of this unit on either side to wind the hose which is definite plus as far as ease of use is concerned. However, the main highlight of this model is its amazing rotation function. The reel is attached to a solid brass pivot point located under the shelf. It can completely swivel 360⁰ allowing you to effortlessly spin the hose in any direction you want. The design also allows for 90-degree brass swive which helps prevent the hose from getting damaged during winding. Another big improvement in the design is the 8 locking rotating positions. This is more than what you find in most other swivel models. Once you pull out the hose and direct it to the location you desire, you just put the pin back in one of the holes to keep in firmly in place. It’s really an essential feature that will not only give you easy time but also prevent the hose from snapping when you move around. The amount of hose you can retract onto this unit is pretty large too. It has the capacity to accommodate up to 125 ft. of 5/8-inch hose which is a lot of hose that makes the reel suitable for use in medium sized gardens. The 710 comes with a 5 ft. leader hose with metal connectors at the end. If you are going to mount the reel nearby the spigot, that’s probably but if it’s a few feet away, you might need to get a longer hose. As mentioned earlier, all the fittings feature brass galvanised metal that’s durable. Most importantly, there are not leaks, and the pull-on knob allows for easy and convenient release of the hose. The unit comes nearly completely assembled. There are only a few parts to attach, leaving very little for you to do. All it takes is to mount the shelf, attach the reel, screw on the handle and then attach the leader hose, and you are done. The only setback is that, the mounting hardware is not included which rather disappointing but definitely not a deal breaker. Given its solid built quality, complete rotation function and reliable performance, this Liberty Garden Products 710 navigator model is a must-have item for anyone with a medium-sized garden. It’s a beauty that will also compliment the décor of your garden. Las in our wall mount list is the Ames Companies, Inc 2388340. If you are on a budget and want a wall mounted hose reel that’s both affordable and functional, then this will be ideal. It’s well built and attractive yet fairly priced. The Ames Companies, Inc 2388340 has a simple design, but looks really stylish. The neutral cream and brown color scheme is neat and should blend nicely with any outdoor décor. It’s also quite compact, hence it will save you lots of space. Although it’s made of plastic, it’s not a flimsy plastic. It’s heavy duty and feels very solid. It withstand the constant exposure to sunlight and water without getting corroded, rusting or losing its colour. Furthermore, the connection and fittings are made of aluminum which enhance its stability and offers protection between the reel’s components. This side hose reel like the other four reels above is completely manual. However, it provides a smooth and easy spin. You won’t strain much when winding or unwinding the hose. The crank arm is fairly long and turns easily. The handle feels sturdy and offers a firm grip for added comfort as you wind. It’s quite easier to pull out and crank up the hose. There’s an integrated hose guide at the front that helps align the hose with the reel to ensure that it rewinds correctly into the reel and with little hassle. It’s another feature that will make winding your garden hose much easier and prevent it from kinking up. The unit has a pull tab on the side too which allows the reel to swivel off the wall so that you can walk freely without the reel pulling from the side. You will also appreciate the addition of a hook at the bottom of the unit. It provides a convenient place where you can hang the head of the hose when it finishes rewinding to protect it from accidental damage. In terms of capacity, the Ames Companies, Inc 2388340 can support a 5/8-ich hose up to 100 feet. It’s the largest capacity on our list, but it’s fairly decent for small to medium-sized garden. It also comes with a leader hose to help you reach your water supply. Like the Liberty Garden 708 decorative and the Liberty Garden Products 710 navigator, this as well features a tray on the top and as we mentioned, it’s a useful addition that give you ample space to store your garden accessories when using the reel. The construction of the unit using plastic means few hermetically sealed joints that can prompt leaks. Plus, the connections are fixed with aluminum inside which helps to prevent any leaks. There is no much assembly to do. The reel comes fully assembled and all you need to do is to mount it to your wall. However, you will have to purchase the mounting hardware separately as only 4 wood screws are included which are not ideal for hanging it on brick. In general, the Ames Companies, Inc 2388340 is a great basic wall mount hose reel that’s available at a highly affordable price. Despite the plastic construction, durability is not going to be issue provided you take good care of it. One of the major benefits of investing in a free standing garden hose reel is there capacity. These reels are usually quite spacious and will accommodate long hoses, not less than 150 ft.
Another key advantage of using this type of hose reels is that your garden hose gets stored in a container and as such, it’s well protected from the elements. Free standing units are also very durable and often come in decorative style that would blend well in most gardens keeping them out of sight and as well hiding the hose from kids. If you have a large farm, use a long hose or don’t want to attach a hose reel to a wall, then this is the best garden hose reel for you. It’s also a perfect choice for anyone looking for a reel that can accommodate a lot of hose. First in position comes this eley/ rapid reel standing 1402. 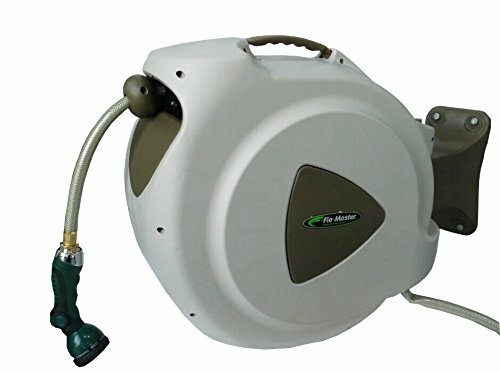 It is best rated for its two unique features, one its high durability since it the best alternative to plastic hose reels. Secondly, it comes along with a 10-year warranty and a no- leak guarantee. It can freely stand since its base is broad and not tipped, in fact it has four-rubbered feet for stability. Furthermore, the eley/ rapid reel free standing 1402 also comes along with a lid, a strong handle and two spikes. Moreover, its top layer is made of a powder finish which increases its durability so you are sure to use this model for many years. The extra water in the hose is easy to direct into a pool, garden or farm plus the water that is wasted in minimal. Besides the above-named features the model; is also made of polyurethane, gooseneck swivel and diecast aluminum which means it is of high quality; it will give you service before wearing off even if it was left outside for days and it also has an anti-rust coating on top which means it does not rust when being used even on those really hot summer days. It is 18.8 x 18.8 x 19 inches makes it occupy less space. The link between the hose and reel are tight hence the model does not leak any water. It weighs 23 pounds hence it does no move around while operating. The model is easy to assemble and immediately use on arrival in your garden since the assemblance guidelines are clearly stated for you in the installation kit. Furthermore, this model is preferable in case you do not want to drill a hole to mount a garden hose reel. Also, it comes properly packaged to prevent any sort of breakage during shipment. It also comes along with a leader tube and discharge hose. Lastly, you can comfortably use this eley/ rapid reel free standing 1402 up to 360 degrees and hold up to 200 feet 5/8-inch of hose size on it in any garden bed. Does not leak since the link between the hose and reel is so tight. It has a 10-year warranty and guarantee. It is a bit light since it only weighs 20 pounds. You need to assemble it yourself once you purchase it. Next in our list is the suncast resin swivel hose hideaway, it is highly rated because it also comes along with a storage bin with a hose guide too, which makes it more durable. Furthermore, it is generally made of durable inputs. Its base is also made of swivel hence a strong stability even during those windy days. Additionally, this model also comes along with a lid and a strong handle and two spikes. Due to its less weight, you yon use it to on your small kitchen garden. It has a one-year warranty which means that it can be repaired in case it fails to work during the first year of purchase. You will also have a variety of models to choose from depending on your preference since there are various designs. Also, you also do not need to buy any tools to assemble the Suncast resin swivel hideaway once it arrives since it comes fully assembled. Rewinding it is not hard since it is hands-free. However, it needs screws drilled on it for stability while being used on hard surfaces since it is not stable on such surfaces. Which might end up damaging the floor. Furthermore, it is light hence you can easily transport it and also since it does not occupy a lot of space; its size is only 21L x 26W x 23.8H. Not only can you use the storage box in this model for storing the garden hose reel but also store other farm tools that you own. Additionally, this model also prevents the hose from UV rays. It also sleekly swivels to the direction of your choice which makes it easier to work with. It also comes well packaged to avoid breakage during transport. The model also comes along with a month return period and also comes with a 100% return policy in case it fails to work on the first 30 days. You can comfortably use the suncast resin swivel hose hideaway up to 360 degrees and holds up to 225 feet of hose dimensions. This model does not occupy a lot of space in the yard. Has a lid and a strong handle hence it is easy to lift. Not really stable on tile surfaces. You might need to drill the floor. The return period is relatively short. In third place is this suncast aquawinder 125’ wicker. It has the best decorative hideaway since its storage accessory is highly decorated hence adding a certain level of décor in your yard. You can use this hideaway can be used for other farm tools too. You can easily use the hose since it is hands free. It is also retractable since when not in use this model flattens hence occupying less space. The suncast aqua winder 125’ wicker also prevents its hose from UV rays. It is also made from vinyl which means that it is highly durable hence it gives you the worth for your money. Moreover, this mode comes properly packages which means that it can not be damaged while being shipped to you. It is automatic since the pressure from the water automatically rewinds the hose and it is easy to rewind since it is hands free. It also comes along with a leader tube and discharge hose. It comes with a one-year warranty; the producers are willing to replace the product in case it fails to function during the first year of purchase. Moreover, it has an anti-rust finish which helps it withstand even those hot summer days without out wearing put or rusting. On top is a powder finish which improves its durability so you are sure to use this model for many years. It rotates up to 90 degrees hence you do not need to keep on rotating it manually. For equal winding. It has a smart Trak hose. It is 24 x 27 x 23.5 inches hence does not occupy too much space in your yard. A bit light for you to lift as it is only 17.3 pounds. It can hold hoses of up to 125 feet of 5/8 and it smoothly swivels to the direction that you want it to. It is retractable which means that it occupies less space in the yard while not in use. It only rotates up to 90 degrees whereas other models rotate up to 360 degrees. Relatively light since it is only 13.7 pounds hence maybe carried away by the wind. The warranty may not apply if the product is purchased in certain retail shops. Last but not the least is this suncast resin hose hideaway which comes with a hose guide. It has the best hideaway decorative since its accessory is stylishly decorated and made of swivel ensuring its durability. It also has a slide Trak hose guide which makes unwinding and winding of the hose easy. It comes while properly packaged which protects it from any damage while being shipped to your place. However, it comes in the fourth place since it is manually used which might be a bit tiresome for you. Especially if you are used to using the retractable models. However, this model comes along with a strong handle which, makes it easy for you to lift it up if need be. It also has a well-crafted design which makes sure that the hose is properly covered to keep your landscape neat. However, this model is back up of plastic materials which means that it may not last long but it comes with a fold hand handle which makes it easy to lift. It is relatively light since it only weighs 16 pounds. It does not occupy a lot of space in your yard since it is only 19 x 21x 15 inches. The suncast resin hose hideaway with a hose guide does not leak since the seal between the hose and reel is totally tight. It comes while readily assembled hence you do not have to waste time setting it up for use. You can work with it for up to 175 feet of 5/8 hose dimensions. One down side is it’s relatively light since it weighs 16 pounds hence may need more than one person while operation to prevent it from moving around. Has a slide Trak hose guide which makes unwinding and winding of the hose simple. It has to be manually operated which is a bit tiresome. It is not as durable as the other models since it is made from plastic materials. The hose guide may not rotate in all sides as required while watering plants. You may need more than one person while operate to prevent it from moving around. Hose reel cart is the most portable type of all the garden hose reels. The fact that it comes with either wheels or ergonomic handles and that they are often lightweight makes this unit very easy to move around with it while carrying out you watering tasks. They are also very spacious and can accommodate both the hose as well as other gardening equipment and tools. Carts are perfect for those that have a larger yard as they can hold up 400 ft. of hose. They are also ideal for anyone that don’t wish to leave the hose outside. You can easily roll the cart reel inside a garage or shed. If you are a professional landscaper, this is also a good option. Despite each model in our list standing out in some way, the Eley/ Garden Hose Reel Two Wheel 1043 top the list in so many ways. If you are willing to invest a generous amount of money to get yourself a high-quality durable and portable hose reels this is the best rated. This unit is a product of Eley currently the most popular highest quality manufacturers of garden hose reel products. It’s constructed from aluminum alloy along with Brass Swivel which and do not rust. Eley 1043 is kept secured and organized with the flanges on the reel wheel. The wheel is one of the best outstanding features in all of the products in this review. It has a wide base with small and wide tread design to maintain stability and not sink or stuck into the muddy ground. In addition to that, the wheels are filled with resin so no unnecessary puncture ensuring smooth operations. This also means you can’t inflate them, therefore, puncture free, isn’t it exciting? The aluminum powder coat finish might sustain many years to come surpassing your expectation in regards to durability and performance. Consequently, you’ll never worry about leakage with Eley 1043 which is backed with 10 years no leak, no break and no rust 100% guarantee! This unit can be used for both residential and industrial, as it’s easy to move around using wide tires. Subsequently, this hose reel only weighing 33lbs, you can reach different places cleaning your vehicle, watering plants/ flowers or even, finish up on your commercial activities. The unique grip crank handle design, grab and pull/push handlebars has improved winding and unwinding of the hose which is now easier despite right/left-handed. Eley 1043 doesn’t twist easily when trolled back. The breaks secure the hose and prevent it from unwinding itself. This model is very stable, which improves its mobility. This hose reel has a capacity of holding up to 150ft of 5/8̍̍̍̍̍̍” hose. However, you can increase the capacity by expanding the width of the center drum to carry a longer hose up to 225f. Cleaning can be done easily by separating the wheel and the cart. Use either a cloth or pressure pump to remove solid dirt before storing for proper maintenance. Assembling the Eley 1043 is simple and can only consume at most 30 minutes of your time to finish. The good part is there is no drilling whatsoever, you need to join the parts together using screws while holding with a wrench. Attach the knob, am break and axle to the flanges. When tightening add oil into the coupler’s thread. Then finish with the hose and nozzle. However, it comes with installation instructions and diagrams. The Suncast 175′ Hosemobile garden hose reel cart is the most ideal solution for appropriately storing your hose. It is, in fact, the best two wheels plastic garden hose reel available in the market. When compared to other similar types of hose reels, it has an outstanding design that really helps in storage and space saving. One of the most important features to look for when purchasing a product is quality. This Suncast unit has a superb design and is constructed to last. It is made using molded plastic that can last outside for various reasons without showing any signs of corroding or rusting. This makes it highly durable. Another attractive feature of this unit is its unique design. Its contemporary design keeps your hose neat and tidy whereas it’s brown taupe finish blends in easily with a majority of exterior paint colors. Space saving is yet another unique feature that this unit boasts. It is available in a variety of styles to suit any space and taste. The hosemobile compacts up to 175’ of garden hose to keep out of your patio, lawn or garden. It comes equipped with six-inch wheels. These large wheels make it effortless to pull and maneuver around garden or lawn as it actually spins with ease and does not get stuck. In addition, this Suncast unit has an easy link system. Also, it has hose hooks that hold the end of a garden hose and leader hose. This system ensures that there is a watertight connection between hose reel and hoses. It can be used with standard 5/8 in a vinyl hose. However, it only has a 175′ hose reel holding capacity whereas another garden hosemobile has more. This is an important thing to note before choosing to buy this product. This unit is one of the best garden hose reels available online. It has an easy ordering process and it comes fully assembled hence no assembling tools needed. This means that you can buy it and put it to use almost immediately. A four-wheeled hose reel cart is more convenient because you don’t have to add extra effort to troll the cart around. Giantex Garden Hose Reel Cart being heavy duty is a suitable cart if your garden or lawn is not leveled. This unit works well for those who wish their garden Hose remain untangled. It’s a high-quality hose reel with a very attractive design which creates a form of solid stability on the four wheels. It has fair inflation wheels that are 10” inch wide making it easier to move on the uneven surface. Besides, the handles are foam-padded to offer comfort on your hands whenever your working with the carts for a longer period of time. The steel frame is coated with green powder, as a result, it makes the hose reel water-resistant and rustproof thereby protecting it from external environmental elements. The powder is meant to last for years and more years to come. This model is constructed from a heavy duty steel frame and solid steel axles for both durability and sustain the efficiency of the reel. Giantex Garden Hose Reel Cart with four wide pneumatic tires allow you to maneuver easily over almost every terrain no matter the unevenness. Moreover, it allows you to reach even the corners of your garden with ease, or even use it on commercial places. Another great thing about this unit is its large capacity. It can hold up to 300ft of 5/8-inch hose which is a great length for your daily watering and can pour water in the unreachable area in the garden. The foam-padded handles give a firm grip with no chances of any slip. The foam offers quite comfortable experience, therefore, improving your performance in the farm. The green powder finish on the steel frame assures effective performance for more years. A rust-free hose reel means there is more efficiency and the cart can be reliable to perform well every day. The winding process is much easier with the of foam-padded axles, in addition to that is the storage space which works great when gardening, you can place some of the required garden tools and then just carry on your duties. This unit is great in terms of appearance and keeps your hose perfectly fit and untangle. Above all, this product stands out as one of the best four-wheel durable heavy-duty hose wheels in the market today. The Liberty Garden 871- 1 is uniquely constructed with strong 4, 8-inch pneumatic tires which are tall enough to easily navigate. Also, they offer great stability and support for it to manoeuvre around with, when performing your landscaping and garden chores even on those rough grounds. However, the tires may not hold air for too long. It has a stylish basket in the middle which can hold up to 250 feet of 5/8 while the hose is excluded. In case you have been wondering where to store your sprinkler and farm tools like gloves and sprayers while in the farm, then you can place them in this basket since they will be easily accessible. Its handles are made comfortable to use of the pads added to them. The garden hose that the Liberty Garden 871- 1 comes with is 125 inches and is threaded all over with Teflon tape which highly prevents leakages. Furthermore, it has a 5-inch leader hose made to withstand any type of weather and which you can use to connect to your house. The extra water in the hose is easy to direct into a farm, pool garden or garden after use. The 13-gauge steel makes it highly durable, its powder finish of brass and coat on its top layer prevents it from rusting so you can use for long hours in the sun. In addition, with only 36 pounds, it is portable so you can push it around your farm with ease. Also, it is only 23 x 19 x 18 inches so it does not occupy too much space in your yard. Assemblance of this model is easy since it comes with a manual too so you can do it yourself in a few minutes and start using it immediately; you do not to buy need any tools to do this. It has a 90 degrees swivel connector that ensures smooth flow of water. On purchase it comes with a lifetime warranty giving you a chance to return it in case it fails to work after you have bought it. This is a good choice in case you do not need a hose reel that does not need being mounted on the wall. It is shipped while properly packaged to prevent damage before reaching your homestead. It is also very affordable. It can be used for commercial, residential and also professional purposes. It is easy to maneuver with even on grassy and rocky grounds. Besides the stylish and appealing design, Arksen Hose Reel Cart has a very favorable market price for you compared to other hose reels in the market, it also has a 6 feet leader hose which is made with strong rubber to prevent breakage and to increase durability especially due to exposure in the sun. With this hose size, you can also easily connect it to the water supply. To prevent the Arksen Hose Reel Cart from rusting when exposed to the sun for long hours. It is made with stainless steel; for this same reason it is also coated with a powder finish on top. It keeps the hose clean and always ready for use. You can also use the hose to pass through hot water without any damages. With its 4. 10-inch strong pneumatic tires offering stability and less center of gravity it can hold up to 300 feet of 5/8” water hose. The tires also make it easy for the Arksen Hose Reel Cart to operate even on those rocky areas on your farm. Between the hose and the water reel there is a very tight connection which prevents leakages. Its dimensions are 37-1/4″(L) x 22-1/2″(W) x 40-1/2″(H) which means that it does not occupy much space in your yard. Unfortunately, does not have breaks to prevent it from moving forward which can be a bit of problem while working with it. However, it has a swivel joint which ensures free and smooth flow of water while being used. The Arksen Hose Reel Cart is only 21 pounds which makes it really portable to work with. If you decide to put it in your yard, it will only occupy 13 x 10 x 5 inches which is a small size. It produces 0.1 decibels while operating which means that it will not make any noise. The model is easy to set up for use in your farm because the assemblance steps are clearly stated for you in the installation manual. Its handles are padded hence making is easy for you to work and has and it is also built in a design that you can easily pull behind for efficiency while working. In case you decide to purchase this model, you have the privilege of a one-year warranty, meaning you can rerun it if it does not work in the first year of purchase. The manual rewind yard hose reel it comes with is a great feature since it makes operating the model quite convenient. Notably, with this unique feature the model can be used form residential and professional purposes. Choosing the best garden hose reel that’s convenient and perfect for your hose requires careful evaluation so as to ensure your hard-earned money is well spent. You need to keep some important factors in mind while making your evaluation. The first thing to consider before you choose your reel is the length of the garden hose you need or use. You need to know beforehand the overall size of the hose you are planning to use so that you can choose a unit that can accommodate it. The best way to do this is to determine the position of the water source and the length of the furthest point on your garden from that water source or outside tap. Once you know the length and then you would want to go for a hose reel that can hold a slightly large hose than yours, preferably 50 ft. longer than your hose. It’s more convenient to pick a model that can accommodate a bigger hose than a smaller one. That extra length will provide an allowance for expansion and contraction of the hose during the warmer months. Generally, knowing the overall size of your hose and garden in mind will not only help you pick the right unit, but will also make the selection process much faster. Manual or Automatic Winding Mechanism? Once you have determined the length of your hose, the next thing to consider is the kind of reel you want to get. Should you go with one with a manual or automatic winding mechanism? With a manual hose reel, you will to physically turn a simple crank in order to wrap up the hose. They involve some energy and take a bit of time, but are certainly very very affordable. If you have a small garden or yard or a short hose, then you can save money by getting a manual operated hose reel. Automatic hose reels are a better choice if you have a large farm and a long hose. Most of them come with a spring-load mechanism that allows the hose to wrap automatically without any kind of obstacle. It can take only a few seconds to get a long hose ordered and little no energy is spend on your end. Therefore, for a small garden or if you are on a tight budget, a manual hose reel would be good for you, but if you have large garden with a long hose, then an automatic hose reel would be more ideal. Cart, Freestanding, or Wall Mount? While considering the winding mechanism you need also to factor in whether to go with a stationary unit or a free standing reel. A hose reel with cart is a perfect choice for those with large gardens since it’s highly portable. You can easily move it to the areas that are really necessary. This type of hose reels come in two versions, one with wheels and the other without wheels. The ones with wheels make movement around the garden much easier and you can access almost anywhere. If this is the type of unit you want, then you want to make sure that it has practical wheels that are stable and can slide easily even on an uneven terrain or lawn. If you are going for the wheel-free version, ensure that it has thick ergonomic handle with non-slip rubber, so that you are able to lift the reel with much ease and take it where you want. You also want to ensure it’s a bit lightweight, otherwise it might be overwhelming. Most stationary units are fixed permanently on one place and a good example is a wall mount hose reel. You can mount it to the wall, so that it’s always in the same place and also at your disposal when the need for it arise. A wall mount hose reel would be a perfect option if you have a small garden and you don’t need to move around so much in order to water the whole garden. However, there are wall mount models that can accommodate long hoses, so they can be a good option too if you have a medium-sized garden. One thing you should ensure though when purchasing a wall mount reel is that it has a solid, durable construction that will remain very sturdy once mounted on the wall. It would be also more advantageous for you if you can get a unit that can swivel probably 180 to 360 degrees, so that you will be able to rotate the hose and get to cover every part of the garden without any difficulties. Most hose reels are designed to be left outside, so durability should be paramount. It should have a very vigorous, solid construction that can endure any weather conditions. You also want to make sure that the unit is rust proof so as to ensure its durability. In most cases, hoe reels are made of either metal or plastic. Aluminum is most common metal used as it’s quite durable and doesn’t rust easily. Rust is of the main cause of damage to most internal parts of hose reels. Therefore, if you are going with a metal hose reel you want to ensure that it has a heavy-duty die-cast aluminum or powder coat finish to prevent the interior from rusting. If you are considering plastic hose reels, you should make sure that you pick a unit that’s made from a tough, thick plastic that’s durable and can withstand the outdoor conditions. The key here is to pick a quality unit that can serve you for long and give you value for your money. It’s better to spend more on something that will not break down after just few months of usage. You should as well consider the look of the hose reel. You don’t want something that will give your garden a touch of ugliness. Look for something attractive. You can find some eye-catching designs in our list above that you can choose from. Regardless of the hose you are using, you will definitely need a number of fittings. One thing you should not that when you experience a leak, chances are it’s something to do with the kind of fittings your reel uses. Hose fittings are generally made from either metals or plastic. Plastic fittings are the cheapest but tend to leak easily over time. The best option are metal fittings made from either galvanised brass or aluminum. They are stronger and will last longer with minimal leaking. You might also want to consider a unit that allows you to lock the hose in place when you are down unwinding it or when you pull it out to your desired length. Your garden hose is a very important tool. It helps keep your garden well watered and your compound clean. However, rolling up a longer garden hose can be really tedious and time-consuming. Furthermore, leaving it lying around is not only risky, but also ends up making your yard look messy. Fortunately, a hose reel can help solve all these issues. With it, you are able to safely and properly store your garden hose. It offers a convenient way of storing the hose and makes the rolling process really easy and fast. Plus it ensures that it’s always readily accessible whenever you want to use it. Wrangling a garden hose securely and neatly is vital not just to preserve the hose, but it also makes your garden look neat as opposed to leaving the hose lying down on the ground. While there are many garden hose reels out there that can help you wind and unwind your hose, you should pick the one that will make using your hose convenient and comfortable. Not a reel that will later on disappoint you with its performance. All the hose reels we’ve included in our comprehensive review are well built, durable and easy to operate. They are not the only ones available in the market, but they are certainly a good place to start for anyone looking to get their money’s worth. Our list covers all the types of garden hose reels and we hope that together with the buying guide we’ve prepared above, they will help you make a more informed decision and pick the best model that suites your needs and budget.